Welcome back to our R&Q Q&A series, where we ask R&Q employees how they make their impact at R&Q. This post features Sherri Hall - Project Engineer. We hope you enjoy! This is our R&Q Q&A series. 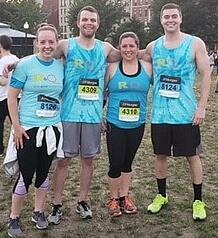 Every few months we ask R&Q employees how they make their impact at R&Q... and the impact R&Q has had on them. From improving people's lives to R&Q's rewarding culture, we hope their answers shed light on how our company influences the medical device industry and why our employees claim time and time again working at R&Q is a highly fulfilling experience. View all R&Q openings on our Careers page. Sherri: What attracted me to R&Q is it was a small, fast-growing company and there were endless opportunities to learn as you can go from client to client and gain new experiences quickly... all in a very short time frame. Sherri: Improving lives is different at R&Q than anywhere else because your reach is so wide. For example, I’ve had the chance to work in cardiology, orthopedics, respiratory care, pain management, combination devices, elder care management, and more within my tenure at R&Q. I can think of many people in my life who may have potentially benefited from the products I've touched. Sherri: R&Q’s culture is unique because everyone is so easy to work with and willing to help each other. Walking into the office makes you feel like you’re walking into a family member’s house. People at all levels of the company are accessible to you, all the way up to the president. Sherri: What’s different about R&Q is we have a truly dedicated sales team responsible for securing new business. This allows me, as a technical consultant, to focus on providing my clients with technical resources rather than worrying about what’s coming next. Central resourcing places us in the spot where we can best showcase our talents and support the company. 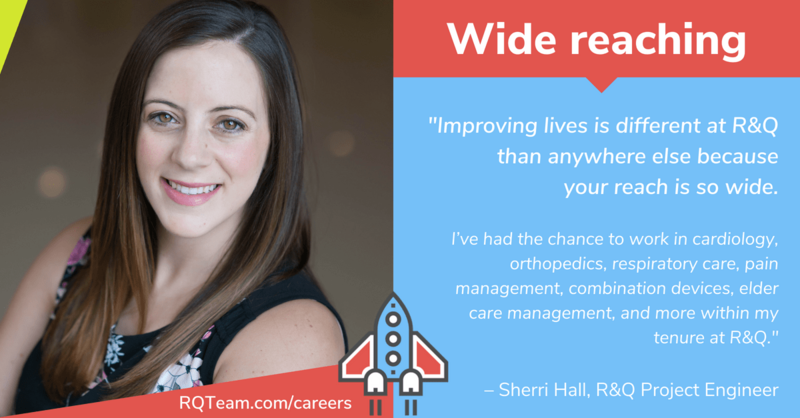 Sherri: R&Q feeds my passion because we help people‘s lives. R&Q is focused on medical devices and the health industry, and with the growing number of health issues people have in the world, it makes it nice to knowe can make an impact and make a difference. Sherri: R&Q’s vision and mission align with my personal goals. One of the things R&Q strives to do is be a worldwide leader and a preferred vendor. It makes me proud to know we have such a good reputation behind our name and people come back to us time and time again for professional services. To sum it up, R&Q is just trying to help improve people‘s lives and I don’t know how anyone could argue with that vision and mission. It makes you feel good to know you’re part of something special. Sherri: Working at R&Q is special in many different ways. But in my eyes, one example of what’s unique is the leadership at R&Q. I trust the direction they’re leading the company. I have seen many times when they have changed course if something wasn’t working quite right in order to optimize and improve. Management is agile, quick-thinking, and willing to actively fix problems rather than deal with them later. R&Q is strategic about the decisions they make and how they communicate them. Ultimately, I truly believe management is looking out for the best interest of not only the company, but also our employees and our clients. The Senior Specialist contributes to the delivery of regulatory and quality solutions to enable client success. The Senior Specialist prepares work products and executes the defined consulting scope of work, with assistance of more experienced consultants as needed. Minimum of 1 years of experience in the medical device industry (EU MDD, Health Canada, US FDA class II and class III, etc.) and 2-5 years of work experience. Looking for candidates local to Pittsburgh, Boston and Minneapolis. The Design Quality Engineer applies their knowledge to the delivery of regulatory and quality solutions to enable client success.The Design Quality Engineer delivers work products and executes the defined consulting scope of work with moderate oversight by experienced consultants while performing general sustaining design assurance engineer activities (i.e., design related change requests, complaint reviews, risk documentation updates, etc.). R&Q is all about people, culture, community, and begin connected. We want to get to know you, whether there's a current opening or not! If you'd like to have a conversation to introduce yourself and ask questions, let us know. If we already know each other, we'll undersatnd the type of role that's perfect for you when the position becomes available.